Last month, I ran a range performance test to help Tony Williams validate extreme weather range data. He basically needed someone to drive the Leaf from fully charged to zero under an outside temperature of at least -10C. The car had to be charged at 100% and left outside (“cold soaked”) for at least 4 hours before the driving test. Terrain should be mostly leveled, with a mostly stable temperature and no extreme power used. He also provided a list of performance data required to be collected during and at the end of the test. I drove the LEAF around the neighborhood (40 Km/h speed limit) and through quiet roads (70 Km/h). I thought I would run out of juice after two hours or so but the test actually lasted 3 hours and I drove 125 Km at the end, which is quite impressive given the low temperature (-13C at the start, -10C at the end). I kept climate control at minimal though. The heated seat and steering wheel was on all the time, keeping the driver warm, but I kept the air temperature in the cabin at minimal, with the fan at low speed, mostly to avoid fogging the windows. I drove all the way down to “turtle mode”, which basically means one kilometer left of range. I reached that point very close to my house, just in time to pull over the driveway and into the garage for a good recharge. 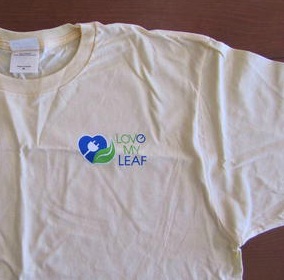 As a reward (yes, there was a carrot to this :)), Tony sent me a nice “Love My Leaf” t-shirt, available for purchasing at his web site, lovemyleaf.com. So here are the full results. Km driven at Turtle, if applicable: 50 meters, before pulling over my driveway.